Could it be that birding gets more interesting, and more exciting, the longer we do it? Dedicated watchers know the answer is yes. The 2018 birding year, officially The Year of the Bird, only escalated our curiosity and passion for the hobby. 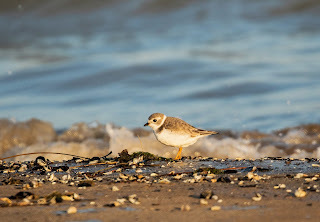 It was remarkably newsy and birdy, filled with feathery surprises, the latter including a plucky little plover, long out of season, lingering on a frigid Chicago beach. A major anniversary hovered over 2018, inspiring the Year of the Bird celebration and calling attention to bird conservation at a critical time. Ironically, just as the Migratory Bird Treaty Act turned 100, it came under attack in Washington. A bill in Congress, HR 4239, would pull some key enforcement teeth from MBTA, our country’s most important bird protection law. National Audubon Society sued the Department of the Interior, with similar suits filed by Attorneys General in eight states, including Illinois. “State of the World’s Birds,” released in April, reported that 40 percent of bird species worldwide are in decline, with one of every eight threatened with extinction. BirdLife International issues the report every five years. on record along Chicago's lakefront. One of those potentially doomed species is the blue-throated hillstar, an Ecuadorian hummingbird revealed to the world in September. An estimated 750 individuals exist. Yes, amazingly, new birds are still being discovered. Northwestern University earned kudos in March for making its glassy buildings along the lakefront less deadly for migrating birds. To reduce collisions, the college applied patterned film to many existing windows and chose glass with patterns visible to birds in some new construction. Chicago Bird Collision Monitors advised. Bird Watcher’s Digest celebrated 40 years of publishing and launched Redstart Birding, a gear company out to fill the void left by Eagle Optics. Julie Zickefoose, artist and author, spoke at Morton Arboretum on back-to-back nights in June. Always the birder and keeping a trip list, Zick observed a nesting killdeer at the Hyatt Regency Lisle—on the roof! The gray jay is now the Canada jay. Remember that when you visit the North Woods. A yellow (not red) northern cardinal, spotted in Alabama, went viral on Facebook. So did several hilarious photos of a high school golfer in Michigan being attacked by a goose. Only his pride was hurt. In March, I happened to be on the Wheaton College campus 90 minutes before the memorial service for Billy Graham. Hearing a mourning dove calling, I looked around. The bird was on top of Graham’s namesake building. Too perfect. A white-tailed kite visited Porter County, Indiana, during the Indiana Dunes Birding Festival in May. Found by Mark Welter, it was the third state record of the species, the last being in 1994. Many festival attendees scored a highly improbable lifer. An out-of-range blue-footed booby sent birders scrambling to Kane County in September. The Kane County in Utah, unfortunately. But the Chicago region offered its own excitement for birders in 2018, and plenty of it. The year began with a mega rarity when Amar Ayyash bagged an ivory gull at the Lake County Fairgrounds. 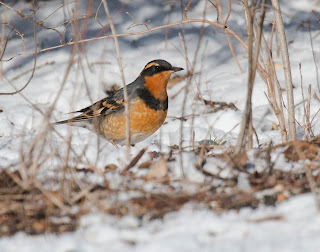 Also in January, birders beat a trail to Palos Park for a varied thrush in the yard of a birder-friendly homeowner. Big Rock, Kane County, our Kane County, would host a varied thrush in November. Notable: Greater white-fronted geese were widespread in late February; common loons were unusually prolific in March and April; numbers of pine siskins were still around in late May; and black-bellied whistling ducks turned up throughout the state from May to October. The DuPage County Spring Bird Count on May 5 tallied a record-high 188 species. Red-winged blackbird was the most numerous one by far, followed by robin and palm warbler. A northern goshawk, spotted by Bob Fisher in Woodridge, was the first SBC “gos” since 2000. A quartet of coveted May warblers visited Elsen’s Hill: cerulean, Connecticut, mourning and yellow-throated, plus a white-eyed vireo. Elsen’s, a.k.a. Warblerville, is part of West DuPage Woods Forest Preserve in Winfield. Morton Arboretum produced blue grosbeak, lark sparrow and pileated woodpecker. Purple martins nested at the Arb for the first time after their long-vacant house was relocated to Arbor Lake on the west side. Four martins fledged. St. James Farm featured worm-eating and hooded warblers in May, and a bobwhite quail in July. Waterfall Glen hosted a wormie, too. A neotropical cormorant appeared in Roselle, on the same pond a neo visited in 2017. Same bird? Hawkwatchers completed their 13th fall season on the hill at Greene Valley, counting migrating raptors almost every day for three straight months. Northern goshawk, Swainson’s hawk and four golden eagles were highlights. The team also witnessed a massive monarch butterfly migration on Sept. 7, and 6,185 sandhill cranes on Nov. 10. Kane County goodies, besides that varied thrush, included yellow rail, red-necked phalarope, scissor-tailed flycatcher, Smith’s longspur and a snowy egret in downtown Elgin. A pair of whooping cranes joined nine sandies in a field near Hampshire in late October. You could fill a book with significant Cook and Lake County sightings in 2018. 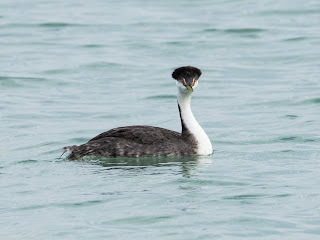 The Lake Michigan shoreline combined with a higher density of active birders once again delivered eye-popping results. 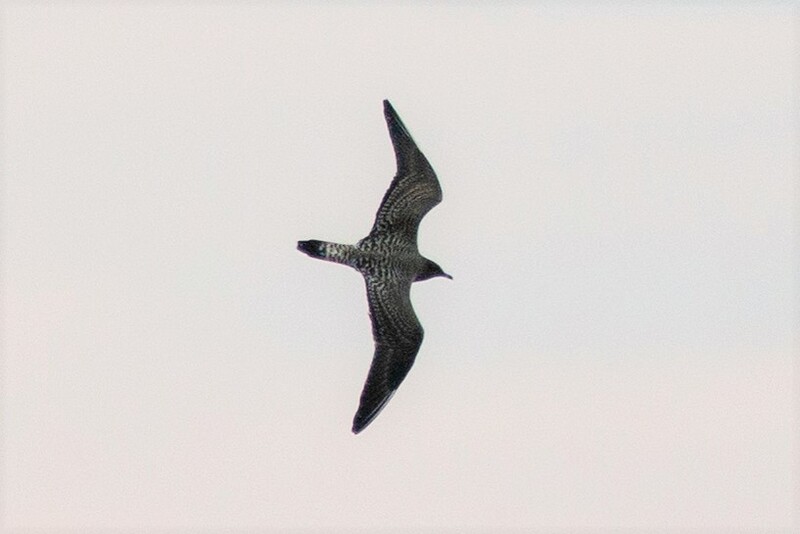 Parasitic and long-tailed jaegers, like avian fighter jets, zipped past Wilmette’s Gillson Park in early September. A western grebe plied Chicago and Evanston waters in November, with harlequin duck, red-throated loon and red-necked grebe also making waves. Montrose beach and the Magic Hedge hosted barn owl, little gull, least tern, red knot, loggerhead shrike, Bell’s vireo and yellow-headed blackbird. 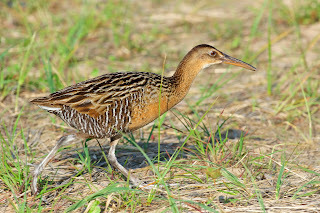 King rail, a secretive marsh species, teased birders with brief but regular appearances in June and July. In May, Jon Grainger discovered and photographed a plumbeous vireo in Bolingbrook, a first state record. Additional Cook treasures included black-belling whistling duck, cinnamon teal, cattle egret, snowy owl, Townsend’s solitaire, western tanager, prairie warbler and Harris’s sparrow. Great-tailed grackle was a premium find in Lake, discovered in August by Bonnie Graham and Joan Campbell at Spring Bluff Forest Preserve. They’d gone there looking for a reported whimbrel. Al Stokie picked a hoary redpoll out of flock of 112 common redpolls at Chicago Botanic Garden in January. In May, he located CBG’s second-ever prairie warbler. The site surrendered a white-faced ibis for Amanda Tichacek. Also in May, a Hudsonsian godwit and glossy ibis shared the same “fluddle” in Waukegan. Piping plover, a federally endangered species, nested on a gravel parking lot at Waukegan Beach, and a colony of state-endangered common terns set up shop in the dunes. A mountain bluebird checked into Knox County in April. Chain O’Lakes State Park, in McHenry, yielded black-necked stilt in May, and white ibis in August. In Springfield, where Governor Rauner proclaimed April 22-28 Bird Appreciation Week in Illinois, rarities included Swainson’s warbler, Mississippi kite and little gull. The roster of southern Illinois birds in 2018 felt Floridian, with brown pelican, mottled duck, anhinga, white ibis and roseate spoonbill all reported. A Sabine’s gull at Dixon Waterfowl Refuge in Putnam County was close enough for Chicago-area birders to chase in September. A second Sabine’s turned up at Carlyle Lake two weeks later in downstate Clinton County. unlikely backyard visitor, given its arrival in late November. Road trips, of course, are optional. In 2018, birders proved once again that amazing things sometimes happen just outside the kitchen window. A western tanager turned up at Springfield feeder in April, and Lombard residents Rick and Mary Lingle noticed a summer tanager at their birdbath in May. The snow and ice storm just after Thanksgiving delivered a chilly American bittern to Diane Swaim’s yard in Aurora. 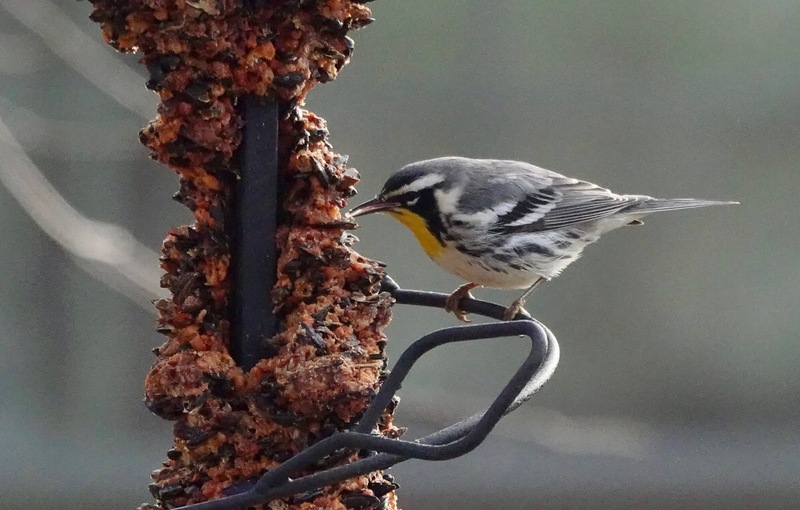 The most remarkable backyard visitor occurred in St. Charles, where homeowner Jonathan Schuler attracted a yellow-throated warbler that forgot to migrate. The bird appeared Nov. 22 and was still feasting on a hot pepper seed cylinder at press time. On Dec. 15, it became the first yellow-throated warbler ever recorded on the Fermilab Christmas Bird Count, an annual event since 1976. My own space in Glen Ellyn produced 78 species, better than most years, and included two flyover additions to the yard list: greater white-fronted goose (No. 117) and osprey (No. 118). And what about that Chicago plover? In the Year of the Bird, I’d call it the Bird of the Year: an unbanded piping plover, first spotted on Montrose Beach in October and still there in early December—by far the latest record for the species in Illinois. As the tiny puffball captured birders’ hearts, it eluded capture by naturalists trying to save it from freezing or starvation. Three rescue attempts using mist nets failed. 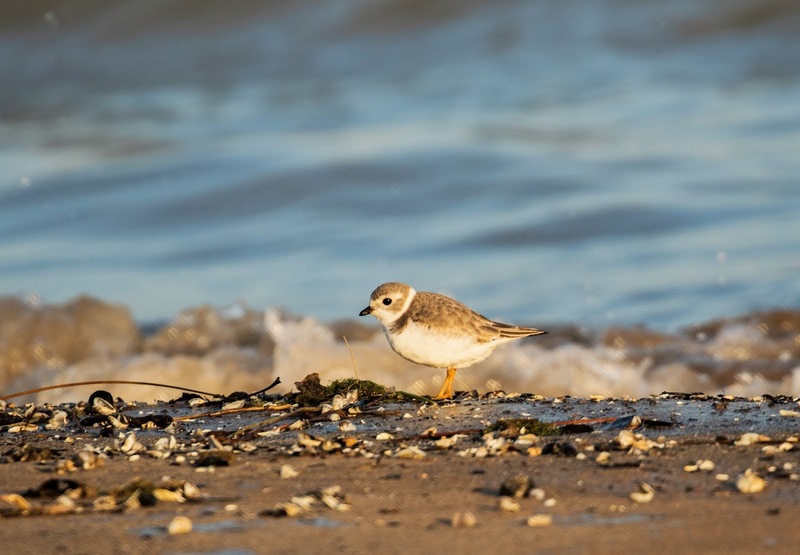 The plover vanished for several days, then made history in another state by appearing Dec. 15 on the beach at Indiana Dunes State Park, just in time for that area’s CBC! Let’s hope the bird somehow survives the winter or, better yet, moves on to a warmer climate. Thanks for reading and may your 2019 be filled with interesting birds! Copyright 2019 by Jeff Reiter. All rights reserved.